The Rensselaer Formula Hybrid team is a student led engineering team operating in and sponsored by Rensselaer Polytechnic Institute. Competing annually in the international Formula Hybrid collegiate competition, RPI Formula Hybrid seeks to design, build, and race high performance hybrid race cars. Contrary to many of the commercially available hybrid vehicles on the road today, the design of our vehicle utilizes a high voltage electric motor in parallel with a conventional internal combustion engine to maximize dynamic vehicle performance in a racing environment. While our hybrid vehicle compares in appearance to a Formula SAE car, it mandates extensive additional design in the drivetrain, battery, and safety systems. The challenge of integrating complex mechanical, electrical, and computer systems is what draws most of our members to the team. We believe that engineering challenges such as this are one of the best ways for young engineers, project managers, and related majors to prepare for the interdisciplinary nature of real-world projects. The recent iterations of our vehicle have featured many commonalities. The vehicle utilizes an in-house designed and welded 4130 chromoly alloy hollow steel chassis. Integrated closely into the chassis is a double-control arm independent suspension system. Mechanical linkages of bellcranks, pull-rods, and shocks allow us to precisely control the profile of suspension travel. An engine from a Kawasaki Ninja 250r, and an AGNI 95r brushed DC electric motor connect in parallel through chains to rear differential sprockets. Weight minimization and center of gravity considerations are critical to minimizing negative effects on vehicle performance. With this in mind, the thoughtful integration of the high voltage battery system (or electrical accumulator) becomes a crucial element of overall vehicle design. Our accumulator is located below the cockpit firewall, at the lowest and most central point in the car. Composed of 440 high discharge 18650 lithium-ion cells, and monitored by a team-designed accumulator management system computer, the accumulator truly represents one of the most complex systems in the car. From the accumulator, high current wire conduit proceeds to a rear mounted motor controller which then directly powers the electric motor. Monitoring sensors at locations all over the car, a PLC implements top level control logic for car functions. While the team uses a custom built battery pack, our charging solution of the past was composed of an assortment of commercially available products. This charging solution was less than optimal. The previous charger was made up of two fixed DC voltage power supplies that were run in series to achieve 80 Vdc. Since each supply always output 40 Vdc there was no good way for us to control at what current or voltage we were charging at. We also had to make a convoluted system for switching when the supplies were charging the batteries to comply with the rules. To monitor the charge state of the batteries we used some handheld multimeters to monitor voltage and current. This allowed us to approximate when to shut off charging as there was no feedback from the accumulator to the charger. The supplies were also not rack mountable, so we had to build a custom case to make transport to our competition easier. Despite its shortcomings, this system was satisfactory for a number of years. This changed at the 2013 competition, when we had a supply explode due to an undetermined issue. This incident sent us on a hunt to find a new supply that better met the needs of our application. We wanted something that could be easily transported and mounted. It also had to be easy to interface with and a minimal hassle to integrate into our existing system. 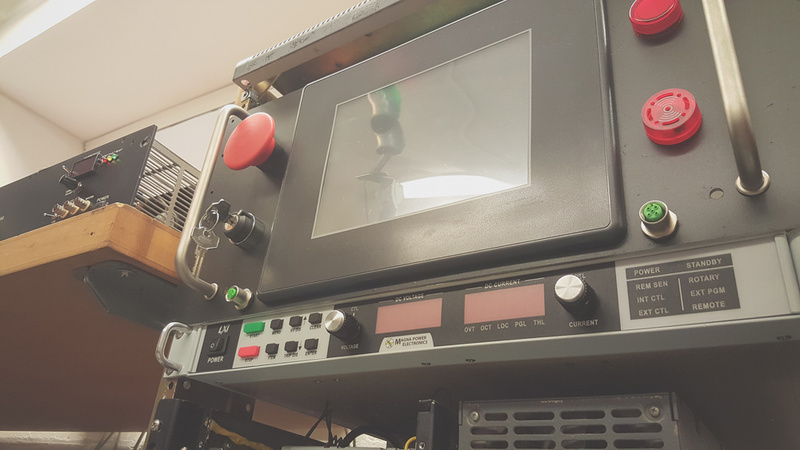 Luckily, Magna-Power Electronics came to the rescue with a donated SL Series programmable power supply. The SL series was exactly what we had been looking for. The 1.5 kW unit supports universal input, so we can run our charger at the track or at the shop without having to worry about finding 220 Vac. Additionally, we find it very intuitive to integrate with an off-the-shelf PLC unit. This allows us to use more complex charging profiles (see example in figure 1),since lithium-ion cells require special charging curves to facilitate safe charging. This was not possible on the old charger, as we had no control over the current or voltage that the power supplies would output. In the new setup we are able to fine tune what current we charge the cells at, as well as the voltage we choose to saturate to. 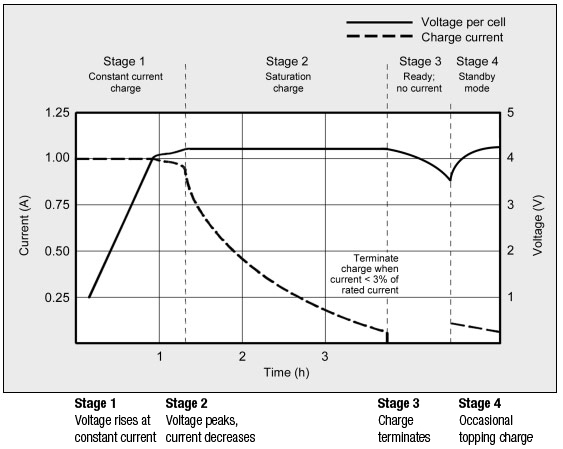 Figure 1: Example of Lithium-Ion Charge Profile. Image courtesy of Battery University. Magna-Power support was also great when we had questions about integration. When the team found itself in need of calibration certificates at competition, a call to Magna-Power support got them to us within 10 minutes. Likewise, since we now control our power supply with a PLC, we can have the charger query the car for information about whether a charge is actually required and if it’s safe to do so. It also scales the charge current back if the batteries start to warm up, thus increasing safety and the cells’ life expectancy. Most importantly, since the accumulator and charger are constantly in communication, the charging operation can be stopped automatically without user input. This frees up team members to work on other important tasks. The ability to rack mount the supply has likewise made transport significantly easier and more robust, as it’s all contained within a rack. Figure 2: Rensselaer Formula Hybrid team's lithium-ion battery charger utilizing Magna-Power's SL Series programmable DC power supply. The team has greatly benefited from switching to the Magna-Power SL supply. More than anything, it helped us realize how inadequate our previous charging solution was, and the new possibilities that a programmable supply can bring. Because of the features integrated into our new supply, our entire vehicle can now benefit from the advantages of intelligent charging and real-time communication. We have also seen an increase in safety and reliability. Most importantly, knowing that we have the flexibility to expand our charging capabilities without investing in an entirely new charging solution makes us confident that it can continue to meet our needs into the future. Kyle Pollard is a senior mechanical engineering major at Rensselaer Polytechnic Institute. He has held the role of chief engineer for the Formula Hybrid team for the past three years. His areas of interest include battery system design and mechatronics.